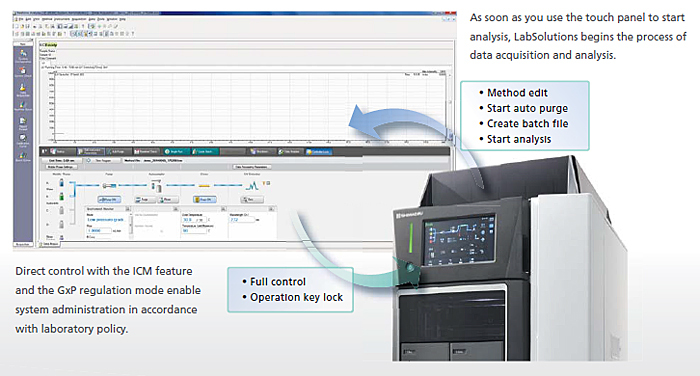 With the i-Series and LabSolutions, Shimadzu offers a new relationship between operators and analytical instruments. 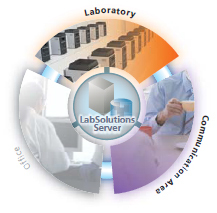 The data acquired by i-Series featuring ICM is sent to the data center via the LabSolutions network and managed uniformly by a server. Confirm analytical results from your room. 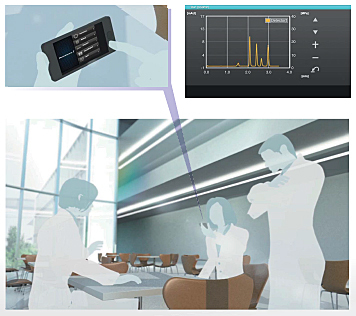 Use a smart device to monitor the current system status and chromatograms from anywhere in the facility. The new ICM (Interactive Communication Mode) feature enables the operator to edit and start analysis methods and batch files from the i-Series. These methods and batch files are uploaded to LabSolutions synchronously. You can also perform routine operations, such as purging mobile phases, while away from the PC. Verify the i-Series' operating status from a smart device without using any special software. With this feature, you can monitor the current system status and chromatograms from anywhere. In addition to monitoring status outside of the laboratory, it allows easy access to a system in a closely-supervised area, such as one installed under a hood, in order to analyze highly active pharmaceutical ingredients.